As mentioned in the previous installment of this series, Norfolk’s history has been well preserved. But the heritage that the region wears on its sleeve is not the only offering of culture in the area. Many of Norfolk’s residents are actively working to celebrate the region, and those that I met helped me feel welcome there. Castle Rising, built by William d’Albini circa 1138. 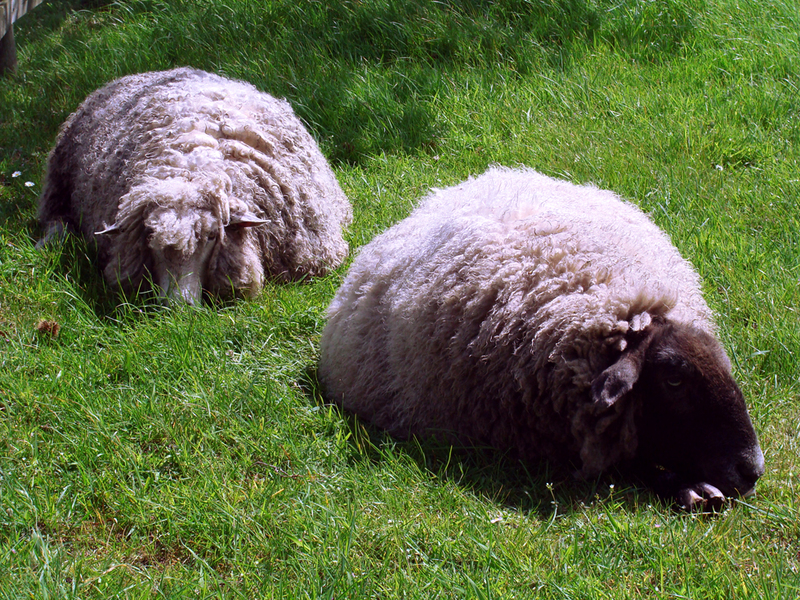 The most obvious cultural character dominating Norfolk is agrarian. My route toured extensive farmland studded with villages, but these hamlets too exude rural sensibility. Chickens clucked from the yards of many residences I passed, and some homes even kept sheep or swine. It seemed like every fourth house was selling some combination of fresh eggs, produce, firewood, or even fudge. “You’ve got to make some money somehow,” said one stranger while I paused to snap a photo of his small stall offering eggs (and I think with only a tin collecting payment). These small towns occasionally come with other quirks. About half way through my first day of cycling I found myself lost while looking for The Real Ale Shop. I cycled into the small town of Wighton (if you look closely at my map in Part 1 of this series, you’ll see a small loop with Wighton at one corner) and was immediately delighted and disoriented in equal measure by what looked like a scarecrow in the middle of a shallow pond. 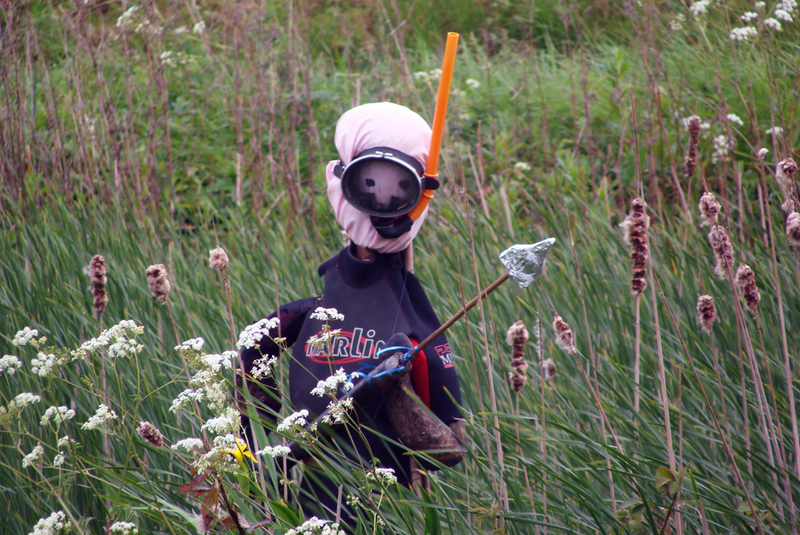 But no normal scarecrow – this little effigy was outfitted in diving gear. It turns out Wighton is home to an annual scarecrow festival the first week of May, and the whole town was dotted with displays. Unaware of the festivities that I’d nearly stumbled upon, I felt a bit like I’d just entered Oz, asking which way to the yellow brick road. The keeper of an art gallery pointed me down a path that seemed sensible on my map, but soon became rocky and muddy. In fact the map warned of this possibility (must remember to read the fine print). Away from the scarecrows, but still lost, I waved to two older gentlemen who emerged from a field with a sheep dog bounding behind. Happy to assist, they directed me to the shop, and one of the men chatted with me about how I came to be on this particular path when I might better be expected in another country entirely. This lion of a man straightened up, exposing his neck tattoo, and with an expression of satisfaction invited me to come see him wrestle in Fakenham in June. I just might! Eventually I did find The Real Ale Shop, but more on that next time. One of the real highlights of the whole weekend came that evening as I cycled into Binham. 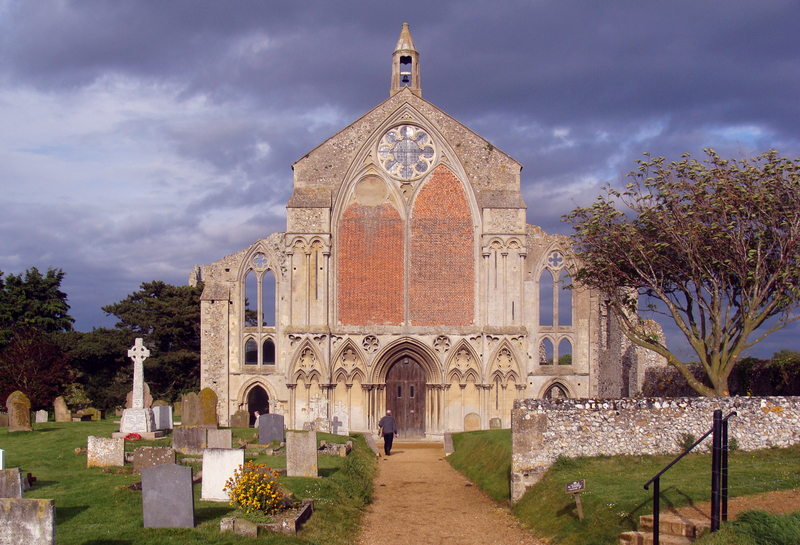 Binham is the site of a Benedictine priory that was mostly destroyed by Henry VII, but whose surviving ruins have been incorporated into the present-day church. I arrived in Binham around 6:30 p.m., and a choral performance was due to start at 7:30 p.m. I had been invited to this performance by my host for the night, Mark Brayne. I met Mark through Warm Showers, an online network of cyclists who offer each other support and companionship during tours. His generous offer to take me in made this whole trip possible in he first place. We both recognized that with a distance of roughly 12 miles between Binham and his home by the most direct route, it might not be wise for me to attend and force myself into cycling after sundown. But wisdom is for fools, and I watched him and his choir perform anyway. After enjoying the first half of the Renaissance-inspired program, I decided to take advantage of the civil twilight to try making those last 12 miles of the first day’s trek. But those 12 miles turned into 15 due to my choice of route, and I was plunged into thick woods where no feeble light left would penetrate. Constantly checking my map out of paranoia of missing the detour I would need to make from the official cycle route slowed my progress until I had lost all light even when clear of the woods. I cheered myself to perseverance and cursed myself for forcing these circumstances, and ended up making it to Mark’s home at the same time that he and his wife, Jutta, arrived by car. We settled in with wine, beer, cheese, and chocolate for a night of chat about science and cycling, history and music. Mark gave me helpful tips about long-distance cycling, and Jutta helped me choose and better course for the next day. Mark and I played some songs on guitar and Mark introduced me to some of the music I’d missed at the performance by leaving early. They were great company and generous hosts, and even more the whole trip really was only possible because they offered me comfy shelter from the cold rain that would fall overnight. And in the morning they offered me a restorative breakfast to keep pedaling on. This entry was posted in travel and tagged cycling, history, narrative, Norfolk, Warm Showers on May 19, 2014 by Dylan Bargteil.